Mustapha Heron, who led Auburn to an SEC co-championship last season by averaging a team-high 16.4 points per game, is withdrawing from the NBA Draft and transferring out of the program, Auburn coach Bruce Pearl confirmed to CBS Sports on Tuesday. Heron's decision was first reported by ZagsBlog.. It's a big blow on an otherwise good day for the Tigers. 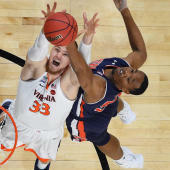 That's because Bryce Brown, Auburn's second-leading scorer, announced he's withdrawing from the NBA Draft and returning to school -- as did Austin Wiley, who missed all of last season because of his alleged connection to the ongoing federal investigation that led to assistant Chuck Person being arrested and charged with federal crimes. The NCAA has reinstated Wiley for the 2018-19 season. So those are two significant developments that should ensure the Tigers are a preseason top-10 team. Auburn is currently 10th in the CBS Sports Top 25 (and one). "I'm really excited to have a chance to coach Austin again this season," Pearl said. "He has a chance to be one of the most dominant big men in college basketball this season. He's such a great kid and a hard worker. All of his dreams for greatness at Auburn and beyond are still alive and well. I also want to thank the Auburn Family for their patience and the support of Austin and his family during this past season." Considering neither Brown nor Wiley was a projected first-round pick, the only real surprise here is Heron's reported decision to withdraw from the NBA Draft and transfer, if only because it had not been considered an obvious option. But Heron's father, Bryan Heron, told ZagsBlog that Heron's mother, Thalia, has been "sick for a year" and that his son wants to transfer closer to the family's home in West Haven, Connecticut, so that he can see his mother more regularly. A separate source told CBS Sports that the mother is "legitimately sick" and that Heron has a good chance of getting a hardship waiver from the NCAA to play immediately rather than sit out a year per normal transfer rules. That source added that UConn and St. John's should be considered the leaders to land the 6-foot-5 guard. "He's going to apply for [the waiver], but if he doesn't get it, it is what it is after that," Bryan Heron told ZagsBlog. "But he definitely wants to be where he can see his mom on the regular."